Gameboard of the Gods | What YA Reading? I siphoned this hardcover out of the Bargain Books shelf of my local bookstore under the false impression that it constituted yet another classic YA novel, courtesy of Richelle Mead: witty, kickass, and unputdownable. Ultimately it delivered on each of those promises, save for the young adult factor. For this reason, I debated reviewing Gameboard of the Gods; my website is named What YA Reading, after all. Finally I determined that, as I am now a legal adult in the province of my residence, this adult book was worth mentioning. Furthermore, as I plan to remain a lawful adult for the near future, at least, this may not be the last “older” novel you see on this blog. You’ve been warned. As far as adult novels go, Gameboard of the Gods was a pretty prodigious prototype to start off with. The characters, for example, were well fleshed out and charming in each of their own particular ways. Mae, the female lead, was altogether kickass and chiefly likeable, despite sometimes coming across as callous and aloof. 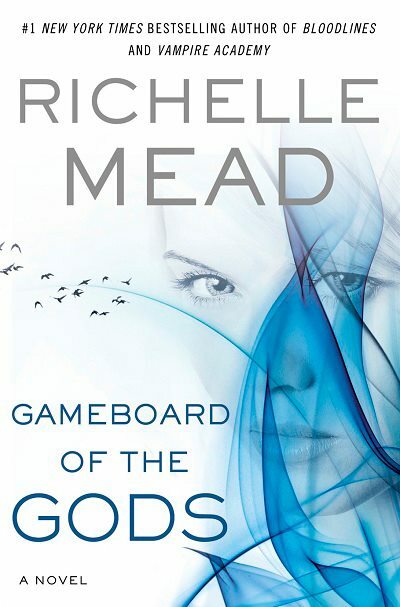 We can, of course, consistently rely on Richelle Mead to write us strong (if shrewd) heroines. Nevertheless, Mae failed to hold a candle to Justin in terms of development. Nostalgic, torn, and clever, for me Justin is the only character who truly came alive off the page. Tessa especially seemed predominantly robotic to me, a cardboard cutout of a wide-eyed refugee, with no true personality to call her own. The romance between Mae and Justin was a concrete reminder that Richelle Mead is a YA writer at heart. Although there was no widely scorned love triangle– and thank the gods for that– the romantic framework between them was too classically unexceptional, too over the top to be true. Unfortunately, this cheapened the novel as a whole for me. I must mention that the world building here is largely absent. That is to say that from page one, we readers are deposited into the depths of the RUNA’s utopian society without explanation or excuse. Culturally relevant vocabulary is lobbed as us– servitor, praetorian, Caine, Mephistopheles— so that we are left guessing until we are able to piece tidings together and fathom their definitions for ourselves. It is not until halfway through the novel that we get any kind of real background. That being said, I honestly did not mind this at all. To the contrary, I quite enjoyed it; it was refreshing to not have your facts handed to you on a silver spoon for once– to be launched into the midst of the action without flowery descriptions or bombastic annals to weigh you down. But that’s me: I like being thrown into the thick of things and figuring them out as I go along. Thus I would only recommend Gameboard of the Gods to you if you’re able to cope with a sink or swim type ballgame. For your sake, I hope you float. Recommended for fans of female gunslingers, stock romances, and urban mythology. This is not a life-changing book that you will remember until your eternal repose; it is but a middling action/adventure. But it is still probably worth your time. 3.2/5 stars.